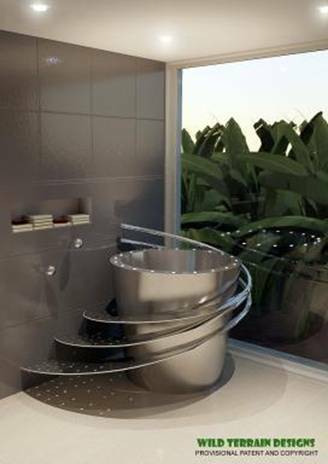 · Electronic Tub-E, light years ahead in the perfect bathing experience. 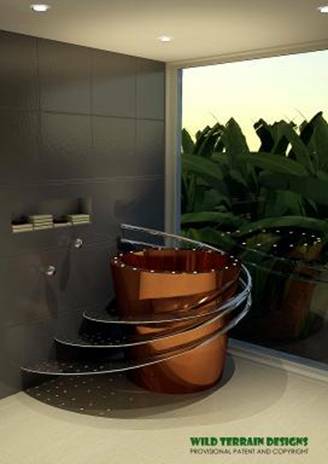 The Tub-E is a world class bath tub in stainless steel or copper, cradled by an amazing swirl staircase, in perforated stainless steel. Pinhole LED lights are embedded into the perimeter, and an inbuilt heater under the seat ensures that the water is kept at the perfect temperature throughout the entire bath. The system comprises an auto fill, auto empty, auto clean option, but also adds any number of essential oils during the fill cycle. The software sits as an adjunct to reception software and offers one touch programming enhancing patrons bathing experience. The overall dimensions are 1200mm wide and 1200mm high, 2500mm wide with the swirl stairs. The tub saves water and reduces labour costs. © Copyright 2009 Wild Terrain Designs. No partial or full reproduction is permitted of plans, elevations or concepts.